We were off for 3 weeks, back to Holland. We went to be with Peter’s dying father and his family. It’s touching to be with someone you love who is dying. We stayed for 3 weeks. When we left in a hurry to Holland, I dried my starter and now I’m reviving it. But, before we can eat fresh baked sourdough bread I have to bake some with yeast. No problem with this great recipe I found. This recipe I found at Uit de keuken van Arden (it’s in Dutch) is a great recipe when you have no idea what to bake and like a good crusty crust and a soft crumb. I went for 2 loaves and that evening we had great Dutch cheese sandwiches. The evening before I made the poolish. The evening before you make the poolish. Mix flour, yeast and water. Cover up and leave on room temperature for 8 – 16 hours. Mix the flour, yeast, poolish and water in the bowl of the mixer. Use the dough hook and knead for 5 minutes. Add the salt and mix another 5 minutes. The dough is smooth and comes off the bowl. Transfer the dough to a lightly oiled container. Cover and ferment at room temperature for 1 hour. Fold after 30 minutes and leave the dough to rise for another 30 minutes. Turn the dough into a well-floured counter. Form the dough into a loose ball and leave for 10 minutes to rest. Form into a ball and proof for 45 minutes or untill the size increased 50%. In the meantime pre-head the oven at 230 ºC. You need to steam, prepare for this. I use a old cake pan with stones. Transfer the loaves to the parchment and score them. 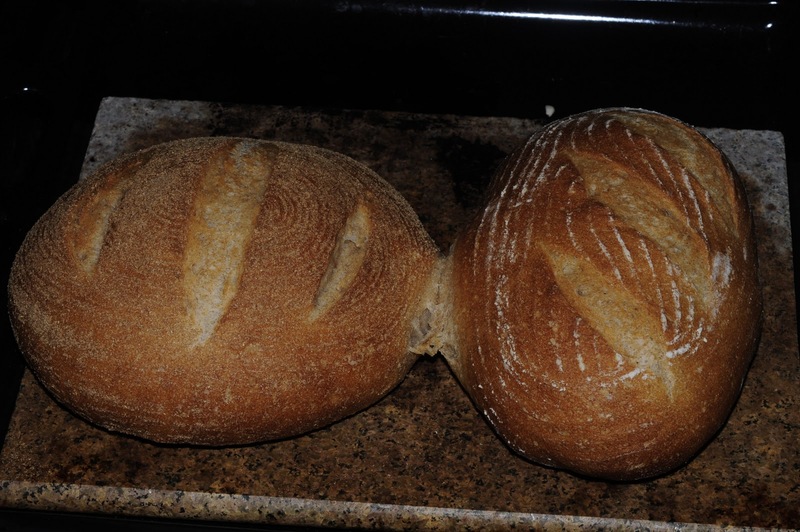 Place the loaves into the oven and pour hot boiling water on the stones. Close the oven door quickly. Bake with steam for 13 minutes and 22 without steam until they are nicely brown colored.